Dainese has gone all out on the Avro line in 2016 and 2017. The new Dainese Avro D2 Two Piece Perforated Race Suit is a bold step forward just as the Avro D1 Jacket was previously. The new race suit has undergone many changes which have dramatically increased the comfort of the suit, and as we know, comfort equals performance on the track. With even larger S1 stretch panels and more micro- elastic inserts throughout the suit, riders will be sharper and quicker than ever. 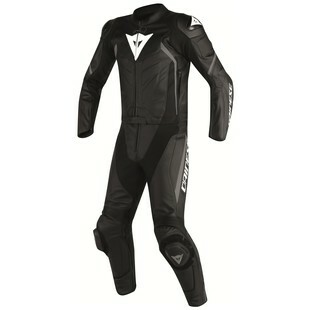 The suit is primarily constructed from Dainese's Tutu leather which is known for its abrasion resistance and flexibility. Finishing touches include race level armor, an anti- microbial liner, and localized perforation, all adding to the theme of comfort, performance, and protection. The Avro D2 Two Piece Race Suit is one of the most well- rounded suits ideal for aggressive canyon carvers all the way up to regular track day enthusiasts looking for top tier performance, without a price tag to match.